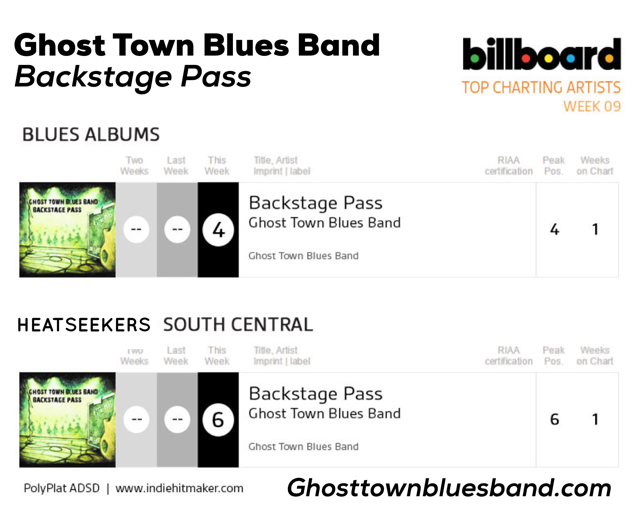 Recently featured at Montreal Jazz Festival, Beale Street’s latest success story, 2016 Independent Blues Award winner for "Best Contemporary Blues Song", 2015 Blues Blast Music Award Nominee for “Best Blues Band” and 2014 International Blues Challenge Runner-up is Ghost Town Blues Band. Not your grandpa’s blues band, their live show has been captivating audiences in the U.S. and Canada with a second-line horn entrance, cigar box guitars and electric push brooms to Allman Brothers style jams and even a hip-hop trombone player. Horns, harmonies and homegrown instruments combined with an energetic and roots rich festival set makes Ghost Town Blues Band one of the “must see live bands on the festival circuit today.” Both Preston McEwen behind the drums and Matt Karner on the bass guitar are a punishing rhythm section behind multi-instrumentalist/frontman Matt Isbell with raunchy cigar box guitar licks and raspy "Dr. John-like, whiskey and gravel-soaked vocals." With the addition of Trombonist Suavo Jones, Tim Stanek on B3 and Taylor Orr on lead guitar, the grooves go from funky to "funk-nasty" as the band gains more notoriety in the blues festival and jam circuit. Ghost Town Blues Band performed all across North America at over 24 festivals in 2016 and already have 25 festivals and 12 international tours booked for 2017/2018.